Now that you have found the person for you, it’s time you pick out the perfect wedding band. These 14k gold wedding bands are diamond cut and brushed to create a flawless patterned look that is intricate and bold. Want to add a personal touch? 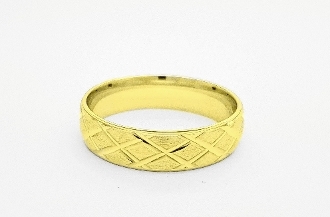 Personalize your rings by selecting the engrave option. All that’s left now is to say I do! These bands are available in both his & hers sizes!